The Mina Justa Project, owned by Marcobre S.A.C. is located in the Ica Province in Peru, around 500 km or a six hour drive from Lima. The site is near the town of Nazca, home of the world-famous Nazca Lines. Once completed, it will consist of two open pit mines and two processing facilities utilizing a 6.0 Mtpa copper sulphide concentrator and 12.0 Mtpa vat leach SXEW oxide facility. Total production will be 100,000 tpa of copper contained in cathode and concentrates. Working closely with our client, Ausenco has helped progress the project from Prefeasibility Study (PSF) through Definition Phase Study (DPS), Independent Peer Review (IPR) and into the Execution Phase. 1. What is your role on this project? How has your background and experience been able to add value to the project? I was engaged by Ausenco to oversee the project delivery phase of this complex project. It comprises two distinct process plants (with completely different flow-sheets), significant onsite infrastructure, overland seawater pipeline and the development of an off-shore port facility for the importation of sulphuric acid. A great example of Ausenco’s ability to deliver a mine to port solution! In the past, we delivered the Sepon Copper Project, which was a benchmark for the development of an innovative copper pressure leach plant in Laos, a country with very little mining experience. 2. Why do you think Ausenco was selected by Marcobre to deliver the Mina Justa Project? Ausenco has developed a global reputation for the design and construction of highly capital efficient minerals processing facilities and the Constancia Project has been acknowledged as a breakthrough plant in South America. The feedback on Constancia confirmed to Marcobre that Ausenco was the best candidate to deliver the Mina Justa Project. We were awarded the PFS based on our track record and our continued performance confirmed our involvement on the subsequent phases of the project. Our innovative low cost, lean design model assisted getting the project over the viability line. 3. What was Ausenco’s involvement with the project in the lead up to the project delivery phase? In summary, at the commencement of the PFS, Ausenco was challenged by Marcobre to develop a capital efficient design. We were then sole-sourced to deliver the DPS where we were asked to confirm that the capex and schedule were sound. Following the completion of the DPS, we were asked by Marcobre to support the IPR of the Project, prior to its sanction. Following the PFS, the client required that the two ore types – bornite chalcocite and chalcopyrite – be processed separately through the sulphide concentrator. The two ore types produce vastly different concentrate grades and have different design head grades, meaning the cleaner circuit requirements are tremendously different. The mine plan we developed will allow the oxide and sulphide ore bodies to be processed simultaneously, streamlining operations and enhancing project economics by targeting the higher-grade sulphide ore early in the project cycle. Our cost-effective design means that the processing plant layout and general arrangements are optimized to achieve substantial reductions in the quantities of bulk materials required, as compared to contemporary designs in North and South America. The design includes two High Pressure Grinding Roller (HPGR) systems – one for each of the oxide and sulphide ore systems. Marcona marine inlet and 40 km buried pipeline providing seawater to the site; Marcona marine acid unloading system, inclusive of sulphuric acid storage tanks at the port and onsite Juhay offsite raw water bore and loading facility. 4. Are we doing anything new and innovative for this design? Vat Leaching: The Mina Justa ore is highly acid consuming and required the use of vat leaching to be successful. Vat leaching involves loading the ore into large concrete vats, which have been lined with acid resistant material, and flooding the ore with strong sulphuric acid to recover the copper to pregnant solution for further processing. The vat leaching installation will be something significant – each vat is massive, that is 46m x 36m x 14m and there are 15 in the train. The total vat train is close to 700 m in length. Crushing System: The combination of the physical characteristics of the ore, compounded by the need for vat leaching has necessitated the design of a very complicated crushing circuit to feed both the oxide and sulphide plants. There are 11 crushers in the circuit and all major types of crushers are represented, namely, jaw, gyratory, cone and HPGR. Material handling: The vats need to be loaded and unloaded with high utilisation. In the case of the unloading system, we have incorporated the use of an intelligent mechanical grab system that will use a combination of field instrumentation and LIDAR technology to operate in a fully autonomous state. To process the 12.0 Mtpa of ore through the leaching system, the grab needs to complete a load/dump cycle every 53 seconds. We believe that this is first time such a system has been used in a hard rock application. Use of seawater in the process plant: Fresh water in the quantities required is not readily available near the plant site, so we have designed the plant to operate using seawater, recovered from near the Marcona Port and pumped 36 km to site. Utilisation of seawater for sulphide concentrators has been attempted in the past but its use in an oxide plant is not commonplace. Marine unloading of acid: Mina Justa will consume a shipment of acid every eight to 12 days. This acid will be delivered to Marcona by ship, discharged to storage tanks and then trucked to site. Approximately 40 truckloads per day. The challenge is to design and operate such a facility within an operating port that has high usage by the local fishing fleet. Hence our facility is designed to be low impact, with minimal fixed installations that may be hazardous to local fishing and navigation. Integrated design: The development of independent oxide and sulphide processing facilities allows for both ore bodies to be processed simultaneously. 5. What are the biggest challenges with this project? The project has a tight implementation time-frame considering the scope of work required. To combat this, we developed an alternate delivery schedule to compress the project’s schedule and reduce costs in the long-run. This consisted of vertical packaging, early contractor involvement, innovative delivery studies and tight project integration. The decision to use vat leaching to process the oxide ore, and conventional flotation for the sulphide ore created potentially high capital costs due to the high acid consumption and water requirements. Ausenco tackled this challenge by incorporating novel crushing and leaching technology to reduce acid consumption, while operating both processing plants using sea water to limit freshwater consumption. The working environment also poses many challenges. The project is situated in a flat desert, 800 m above sea level with frequent sand storms, strong winds, fog and the absence of rain (~6 mm/y). We need to take extra precautions to ensure high safety, social and environmental compliance. The mining market in Peru has accelerated in the past few months and presents us with another scenario which was not seen during the DPS phase. The DPS phase considered market acceleration but not at such a fast pace as is happening in the industry today. This poses new risks to the project and needs to be properly mitigated. The project is currently ongoing with over 700,000 man-hours under Ausenco’s management & zero Lost-Time Incidents thus far. We believe that Zero Harm is an achievable project objective through our proven HSE system. This is aligned with our core values, where we incorporate procedures, tools, risk managements and hazard identifications in our daily operations. Our Environment & Sustainability team has also been involved in managing and replanting native vegetation to help protect the ecosystem and try and reduce the impact of the dry, sandy and windy conditions. 7. How many Ausenco personnel are working on the project? 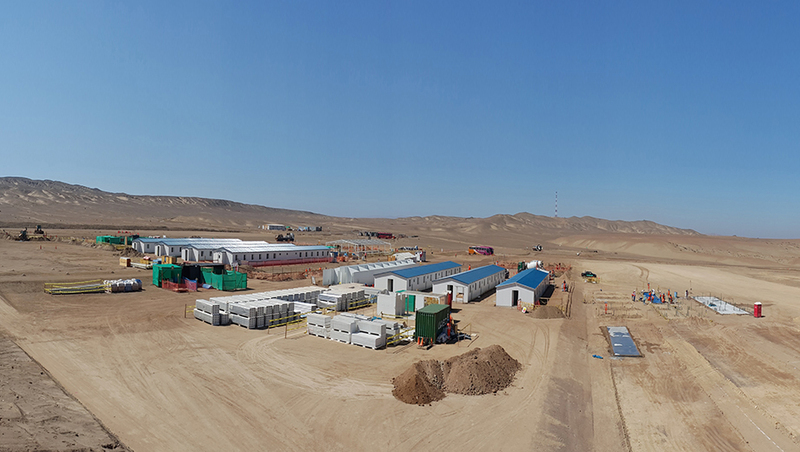 Ausenco currently has 170 people working on the project in Lima and 30 staff on-site. We are also managing around 10 subcontracting teams with a total of around 600 people on site. In the Ausenco project team we have a great mix of Peruvians and people from other countries who are all working hard together to achieve a great outcome for our client. We are looking forward to this project being another success story for the team, for Ausenco and for Marcobre. 8. As you are not native to Peru, what did you enjoy most about living there? I personally enjoy Lima’s food, culture and the Peruvian (South American) culture. The city is rich with beautiful architecture and history and there are many tourist activities available throughout the city. The people are also great and have been very welcoming and willing to share their culture.